Kathleen presents in a “Live it to Learn It” model. Her workshops include many doable, practice strategies so teachers can experience what it feels like to learn in an inspiring classroom. Each session includes a blend of whole class presentations, engaging and interactive group participation, and individual time for self-reflection. All pedagogy will be supported with current brain-targeted and instructional research. 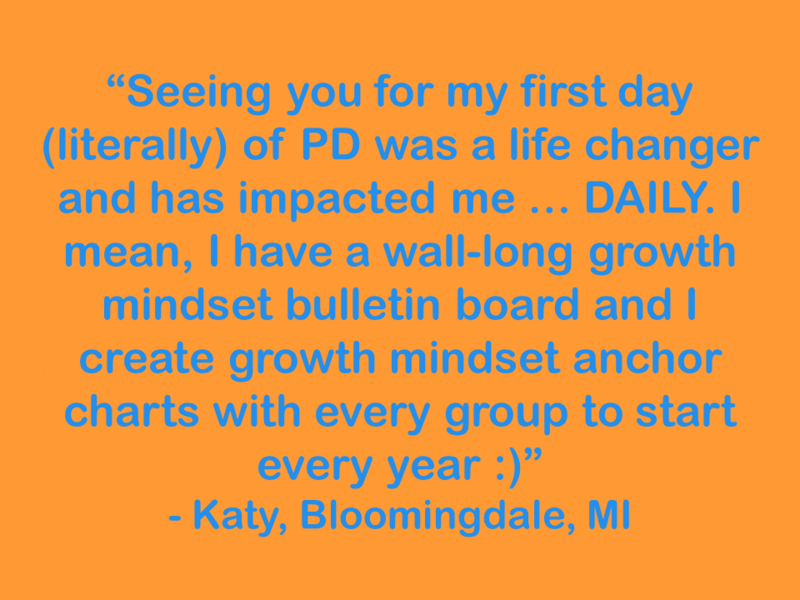 Kathleen’s mission is for you to leave her workshops inspired and excited to transform your classroom and school into a vibrant community of students who love learning. Click on any of the titles below and see a more in depth explanation. Heal Your Self, Heal Your Classroom: Put the Oxygen Mask on You, First! In this workshop, you will learn about this research and be inspired to develop healing tools you can build into to your daily life – small moments to rest and renew. Learn mindfulness practices, relaxation techniques and ways to be more self-compassionate. You will also learn strategies for bringing these practices into your classroom. Heal not only your self – but your students, too. ** You can also have Kathleen co-lead this workshop with Maryann Brittingham, expert in social-emotional skills. Kathleen combines the latest science on self-regulation and executive function with powerful, doable brain-targeted strategies for helping students become responsible, empowered learners. Kathleen teams up with Dr. Jack Naglieri, cognitive psychologist (www.jacknaglieri.com). They combine their knowledge and skills to offer current science and research about intelligence along with effective teaching strategies and techniques to help students THINK SMART! This understanding of the human brain coupled with ways to develop growth mindsets for students by using metacognitive skills is essential for success in and beyond school. **Kathleen and Jack can also do this workshop with teachers and school psychologists together. In many classrooms, 20% of the students are doing 80% of the thinking and talking. If the brain is not engaged, it’s not learning. Learn best brain-based practices for getting students excited, involved and engaged in the learning process. Grow learners who are self-assessors, deep thinkers, and problem solvers. “If we are to reach real peace in the world, we shall have to begin with the children.” Ghandi. In these tumultuous times, it is more essential than ever to teach the skills of peace building in our classroom. Learn the neuroscience behind empathy and hope, along with practical and doable classroom practices for weaving these practices into your daily classroom instruction and developing empathy and hope in your students. Teaching students peaceful ways of being within themselves and with their peers not only impacts student success, but also sends them out of our schools as agents in creating a more peaceful world. Which of Kathleen's inspiring workshops/seminars are you interested in hosting? Take the complexity out of creating an effective, brain-targeted differentiated classroom with easy-to-implement, step-by-step plans and doable strategies. Design engaging and meaningful lessons that meet standards and benchmarks, while honoring the varied learners in your classroom. Whether your school or district is just starting a co-teaching program, or if co-teaching partnerships have been in place for some time, educators will discover time saving strategies and techniques for building strong teaching partnerships using the best collaborative teaching practices. Learn practical, strategies to embed brain research into the art of teaching to prepare students to have the mindsets and the skill sets they need to become critical, deep thinkers as well as effective test-takers. If you are including more and more students with mild to moderate disabilities in your classrooms, then this is the workshop for you. This workshop will help teachers and students make the most out of preparing for high-stakes testing.